The customers of Houston Panini & Provision have taken a serious liking to the restaurant and its cofounders Alex and David Colby. But the charismatic brothers haven’t always been slinging sandwiches. In fact, Alex graduated with a degree in geology and started out working on wells in Texas. David, meanwhile, spent his time in catering kitchens. Things changed in May of 2013 when Alex—after facing challenges in a struggling oil market—dusted off his grandfather’s recipe for lemon-flavored popcorn and saw an opportunity to bring an old family dream back to life. Soon, Alex was making the soon-to-be-famous popcorn in small batches in his home and selling it at local farmer’s markets and grocery stores. 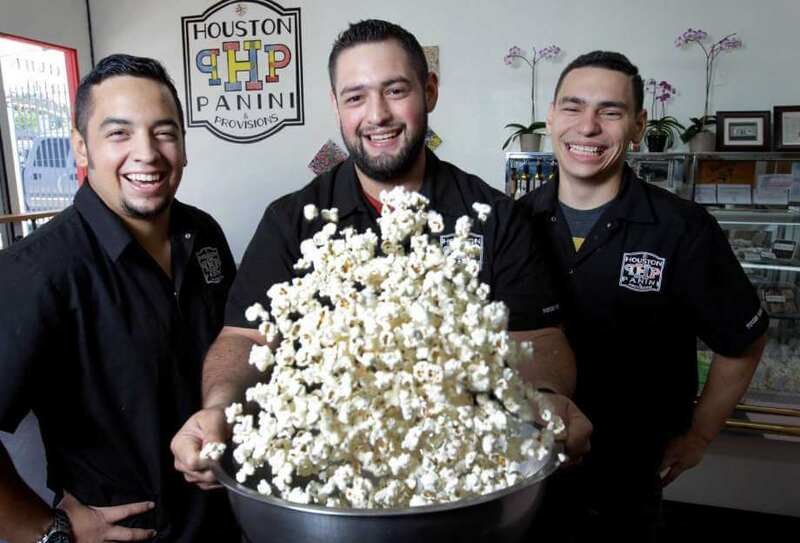 It wouldn’t take long for the product to take off, and after taking a business management course at the University of Houston, he was ready to push things forward with a plan for a restaurant featuring popcorn and paninis. So, the geologist-turned-entrepreneur joined his brother David onstage at an event hosted at the University of Houston to deliver a business proposal to a board of local investors, lenders, and business experts. Between the brothers’ enthusiasm and energy, their thorough preparation, and delicious samples, the panel—forgive the pun—ate it up. Almost immediately, the Bayou Microfund extended an offer to finance their operation and move in to a brick-and-mortar location. Now, a little over two years later, the restaurant boasts an expanded menu and a loyal following. They’ve created more jobs in the community, increased sales, extended into the greater Houston area by leveraging food delivery companies, and show no signs of slowing down.